I absolutely love this! I home school both my children. Virtual classrooms can sometimes be a bore and I have always agreed that fun and interactive learning is the best way to go. History class especially can be a little boring some times. That's why DannyTieger and DreamworksTV created Sung History! Two minutes of musical mischief that's guaranteed to have you singing along with some of the biggest historical figures of all time. 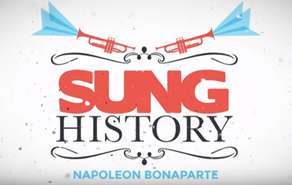 In their first episode Napoleon Bonaparte sings through his triumphs as the Emperor of France…but what kind of emperor was he, exactly? Perhaps he was actually….a penguin? Check out a sample of their first episode that aired this past Saturday. I had my kids watch it who are 11 and 12. While they thought it was a bit hard to understand at times, it does provide the words and a very catchy tune. Once watched a couple times, it quickly becomes a memory. Music has always been a great way to learn. It really makes it so much more fun, interesting and all while retaining important history. Coming up – take a funky and fresh look into the historic stories of Marie Curie, Ghandi, the Wright Brothers, and more.